When it comes to plants which add interest through stem colour during these darker winter months Cornus sanguinea ‘Midwinter Fire’ is hard to beat! 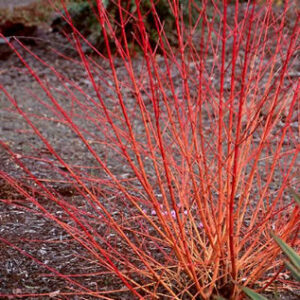 This dogwood is a great choice as, it produce fantastically coloured rich orange, red and yellow young stems. Its winter colour is shown to greatest effect in front of a dark background, and is also effective when grown with other colourful dogwoods with contrasting stem colours. Cornus sanguinea ‘Midwinter Fire’ will grow in a wide range of soils and locations, but gives its best winter stem colour in full sun. To maintain a good vigorous framework only a third of the stems should be pruned each year, and these should be the oldest stems each time.